Rich beech-maple, oak-hickory, mixed swamp and floodplain forests. The very short filaments and long anthers usually make this species easily recognizable; the filaments are rarely as long as 4 mm. The petals may be white [f. flexipes], maroon [f. walpolei (Farw.) Fernald], intermediate in shade, or reddish basally and white terminally. Different color forms may be found growing together. 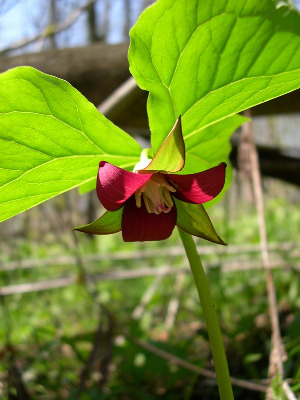 The odor may apparently be either sweet or foul; this varies somewhat with the age of the flowers. Forms with petal colors other than white are suspected to represent hybrid swarms derived from crossing with T. erectum. MICHIGAN FLORA ONLINE. A. A. Reznicek, E. G. Voss, & B. S. Walters. February 2011. University of Michigan. Web. 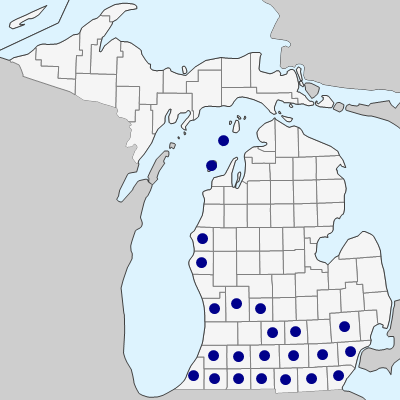 April 21, 2019. https://michiganflora.net/species.aspx?id=2731.